Hoppy Boston Moves into 2019! 2018 was a great year for Hoppy Boston. I celebrated the 5 year anniversary of the launch of the site, and it was by far the best year in terms of total page views, exceeding my expectations by a substantial amount. I also started writing a semi-regular article for The Full Pint, which has been a lot of fun and an interesting way to connect with a new audience. To start 2019 I thought it would be a good idea to review the highlights from 2018 and look ahead to a few goals for Hoppy Boston in 2019. Below you’ll find the five most popular Hoppy Boston articles of the year, my 10 favorite beers I reviewed this year and a few goals for myself and the site in the new year. Later this week I will review the biggest stories in local beer in 2018, and then last year will be wrapped up and I can focus on the year ahead. Cheers, and happy 2019! How Short is the Shelf Life of NEIPA? A (Kind-of) Scientific Study: I was really glad to see people enjoy this article, since in mixed two of my biggest passions, science and beer. The results definitely changed my purchase habits with NEIPAs, focusing on beers that are super-fresh and/or stored cold. Some Thoughts on The Trillium Debacle: This has been the biggest local story of the past couple months, so no surprise that every article written about the situation generated a lot of discussion. New England Beer Hall of Fame Part 1: My Picks: This was a really fun article to write and discuss, and I really appreciate everyone who submitted their own lists and responded to the poll. Brewery in Planning: Pitkin Point: The Mass Brew Brothers organized a series of articles where a different local beer writer profiled a local brewery-in-development. I had a great chat with Tayler Pitkin and look forward to watching Pitkin Point move towards a commercial launch! My Love/Hate Relationship with Untappd: I am still up and down with this app, I said I would use it more and I’ve done a very poor job of that. Here are the top ten beers I reviewed in 2018 in order of preference (based on my recollection, which is obviously imperfect). Links lead to the full reviews. Drink less IPA: I love hoppy beer, and IPA is easily my favorite beer style, but I got burned out on hops on multiple occasions this year. I will still drink and review plenty of IPAs in 2019, but I am hoping to find a better balance between hoppy beers and other styles I love including lagers, stouts, porters, Belgians and wild ales. Stop chasing whalez: I’ve never been a guy who waits in line for beer, and I don’t have time to chase down every limited release. That being said, between a few beer-centric trips I took and the kindness of friends I drank and reviewed a large number of beers in 2018 that you won’t find on store shelves. There will inevitably be some more of that in 2019, I am not turning down delicious beer on a no-whalez principle, but I will attempt to re-focus my writing on finding the best readily available beers in New England. Drink my cellar: I never intended to start a beer cellar, but when Pretty Things announced that they were shutting down I bought a ton of their malty beers and started storing them. Since then my Pretty Things collection has dwindled down to 2 bottles, but I’ve added many others to the cellar. At the beginning of December I had over 30 bottles in the cellar, I’ve already finished a few. My goal is to bring that number under 10 by the end of the winter and keep a steady-state in the single digits going forward. Re-visit breweries I haven’t been to in a while: I see many to-do lists that focus on trying new places, mine is going to focus on re-visiting places I’ve enjoyed in the past and haven’t been to in a while. The current list includes Bog Iron, Idle Hands, Mystic, Notch, Medusa, Cold Harbor, Castle Island and probably a few more I am forgetting! Share more beers with friends: When I think back on my year in beer many of the best memories involve beers shared with friends and family; trips to Maine with my wife, Hill Farmstead with my college buddies, events and tastings with other beer writers, or just grabbing a beer out with a friend or two. It is tough to do this all the time with my busy schedule and young family, but I am hoping to do it a little more in 2019. Figure out Instagram: I was a little late to the Instagram scene, I am a writer so Twitter always seemed like the best place to talk beer, but it’s clear that Instagram is an important location for beer social media. I’ve built a little following, but I am going to spend some time in 2019 really figuring out the ins and outs of the app. Take better pictures: Directly related to point #1, my beer picture game could use a little work. I am hoping to mix in some more creative beer pics along with the standard pictures I take for reviews. Find the right balance between reviews and other articles: One of my goals for 2018 was to mix in more non-review content, and I think I did a pretty good job, but I always want beer reviews to be a central piece of Hoppy Boston. I am hoping to find the right balance between reviews and other articles in 2018. More stories about breweries: Some of the most fun articles to write this year were my brewery overviews for the Full Pint and my profile of brewery-in-planning Pitkin Point. These articles take more work, but I like profiling a specific brewery and hope to do more in the new year. More gear and giveaways: I rolled out the new Hoppy Boston logo and website design in late 2017, and this year I bought shirts, glassware, stickers, coasters and koozies. I also did some gear giveaways, including a t-shirt giveaway for the 5th anniversary. 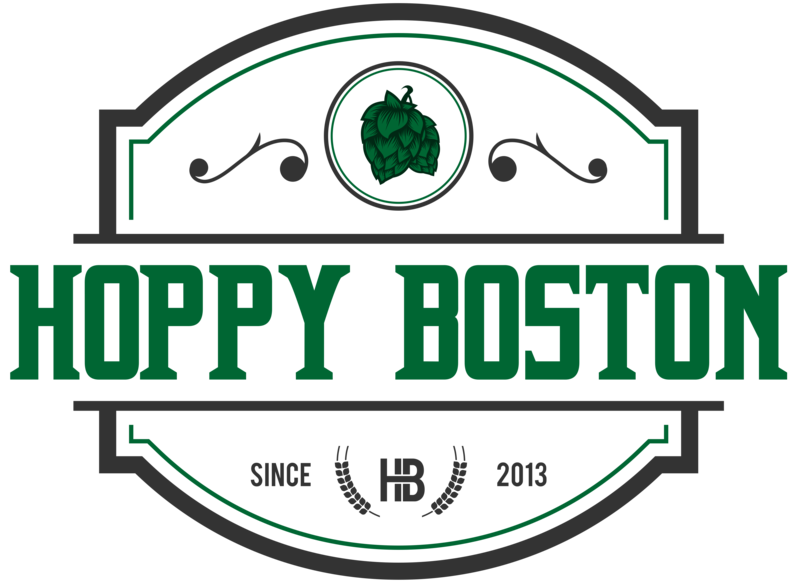 I am hoping to do a little more branding this year and some more giveaways to go with it, if you have any ideas of good Hoppy Boston gear just let me know! In closing, thanks to all of my readers for an awesome year! It is my interactions with other beer fans on social media and in person that makes writing Hoppy Boston so rewarding and I am excited for another great year in 2019. Cheers!